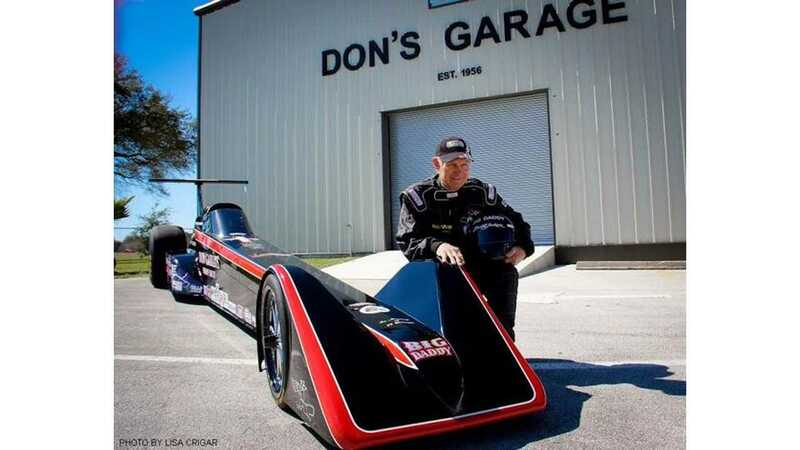 “Big Daddy” Don Garlit already broke 180 mph in the 1/4-mile (7.258 seconds at 184.01 mph to be accurate) on previous tests of Swamp Rat 37 electric dragster at Bradenton Motorsports, Florida in April (videos). But the 200-mph mark was almost still in sight for June. The exciting drive to break 200 mph for the very first time is entering its final phase. The rear end pinion was twisted from the massive torque. Don replaced the 3.50:1 ratio 3rd member with a much stronger Pro Gear 3.20:1 ratio unit. The motors were pristine though the 630 chains were stressed after 8 launches. We upgraded the chains to the same 630 EK drag bike chain that we use on Rocket and replace the synthetic oil in the chain box with a special coating fluid Don uses in his rears. Everything else on the Lawless side was the same as the first test." At 75% power, Swamp Rat 37 reached 8.243 seconds @ 160 mph. 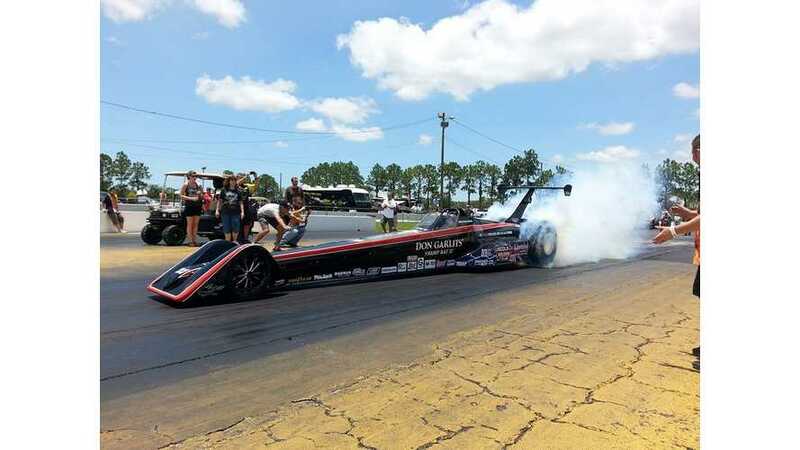 In the second run, close to maximum power resulted in 7.52 seconds @ 173 mph. Then, a series of troubles appeared with controller input voltage limit and rev limiting consequences at burnouts. Finally, a brush spring failed and the team lost the opportunity. Next try to break 200 mph is scheduled for July when four additional changes will be ready! 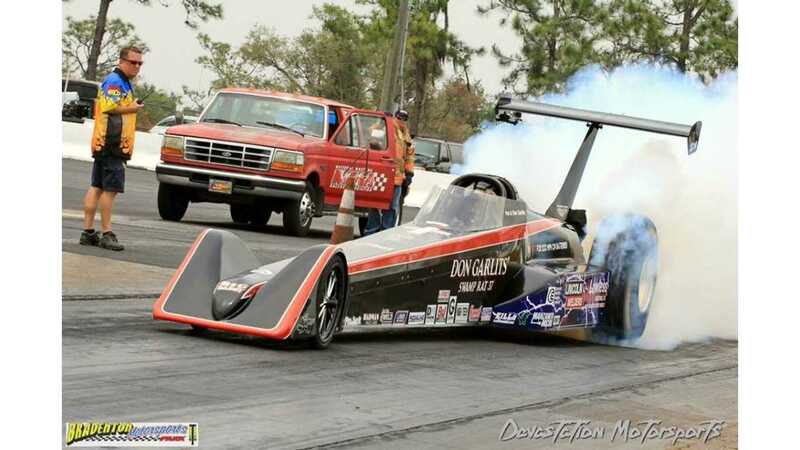 Swamp Rat 37 and breaks 180 mph! "The motors are in a series wiring setup with each pair splitting the max motor voltage. The motors are good for 225 volts each but controller voltage is limited to 425 absolute max and 400 at full power. In an effort to get the most out of the motors at the top end the batteries were charged to their maximum of 420 volts. Previously we had only charged to 410. The idea was that some voltage would "burn off" during the massive burnout at the line. Unfortunately Don reported that when he went to burnout the car had no power and felt like it shut off completely. Don drove the car from the line back to the pit where we uncovered and inspected all electrical system components. All checked out good. A phone call to Otmar confirmed that we had indeed charged the batteries to far to a point where the Zillashad cut back the available motor power to almost zero to protect themselves. That was good news and bad. We had no way in the pits to bleed off the excess voltage so we sent Don on a loop that went down the strip and back the return road. By mid track the voltage had dropped to allow for some real power and Don finished out the run hard. One the way back he added some massive burnouts on the return road to further bring the voltage down closer to 400 volts. We brought Don straight around to the burnout pit and he did another big burnout. At that point I saw some sparks under the car but that is nothing I haven't seen periodically on any of our other machines during abig burnout. We discussed the sparks quickly before Don staged but at that point there was no going back to the pits and delaying the run again. The people in the stands came to see the car run not us looking at it. I told Jeff Garvin who was crew chief to send Don down the track. Just before Don shifted I saw a few sparks from the car then it was all good to the finish. Don told me after the run that he stayed in low a bit longer than he had been until he felt acceleration starting to slow then shifted and the hard acceleration returned and stayed good through the 1/4 mile. The crew at the top end saw a bit of smoke from the car. Initial inspection at the top end revealed no fire so we towed the car back to the pits and stripped off the covers. All wiring looked good. All batteries looked good. All Zillas looked good. All motor brushes, coms and holders looked good till we found the source of the smoke and sparks. What was left of a melted motor brush spring was stuck in the vent cage of motor number 4. Amazingly the brush was still in place! As everyone was waiting for answers we searched for a way to replace the brush spring and get back to the track but the tight design of wedging 6 motors into the chassis made it impossible to replace without removing the motor. On SW-37 this is a 4-5 hr process and it was a day killer on Sunday as there was no point in running the car on 5 motors or even on 6 motors minus every single brush. I broke the news to Don and he broke the news to his admiring fans in the pits, who to my surprise all applauded the effort! He is truly one loved racing legend! I talked to Otmar post race and learned one more nuance of this sport. I had set the rev limiter to 8000 rpm to protect the motors during burnout. It turns out that by doing so I did more harm than good. Otmar informed me that when up against the rev limit the Zilla turns on and off at full power. So during a big time burnout at the rev limit the motors are subject to huge pulses of voltage and current several times a second, much more abuse than they ever see anywhere else. We know from experience that the 7.5 GE's can rev well past 10,000 rpm during burnouts without incident but I wanted to be conservative and set SW-37 at 8,000. The huge amount of power spikes heated the motors and brushes up to the point that the weakest spring couldn't take it and melted of and bounced around motor 4 com causing the sparks and smoke we saw. Interestingly, though all other motors and even the brushes and springs in number 4 were all in perfect shape except for the one that I now hold the remnants of! 1) Raising the rev limiter to 10,000 rpm. 2) Adding a third "burnout" position on the power switch which will limit voltage and current during burnouts while keeping the motors off of the rev limiter. 3) Building a battery load bank and using it to cycle and drain batteries instead of using the drive system to do it. Lithionics Battery in Clearwater, FL has joined the SW-37 team and donated all of the massive locomotive resistors needed to build the bank! 4) Adding 3 Zillas so that the motors can get max voltage of 225 without pushing the battery voltage over the 400 volt threshold. The Lawless team will complete this work and get Big Daddy back in the car sometime in July, just before the 50th anniversary of his last 200 mph first!"